Guest post by Kristen Hawley, creator of Chefs+Tech. The consumer restaurant experience is changing rapidly, thanks to a host of apps, products and services aimed to improve the dining out experience. There are new solutions for ordering, paying, reserving…everything except smelling and tasting, really. A lot of new technologies hit the market and made a splash recently — so how to tell which will stick around and which may fizzle out? At Chefs+Tech, I try to make sense of these new technologies, and now I’ve teamed with Food+Tech Connect to highlight the trends I’ve been seeing. 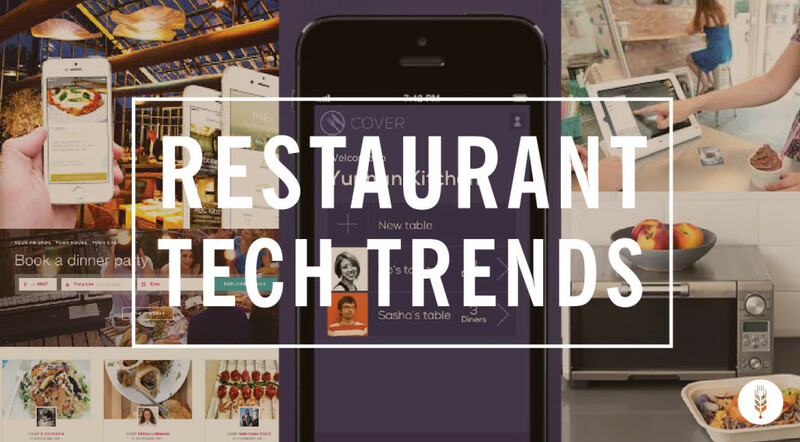 These products and services represent the biggest consumer restaurant tech trends using technology — mobile technology, in many cases — to make the consumer restaurant experience simpler and more fluid. The explosion of startups aiming to disrupt restaurant reservations is, perhaps, the most contentious consumer restaurant tech trend of late. And then there’s Reserve, an app that acts as a concierge. Reserve doesn’t require restaurants to set aside specific tables, but it does leverage relationships to allow users to get into popular restaurants at desirable times. For a fee, rates vary based on the time and the restaurant’s popularity, Reserve books your table, gives the host your name and photo, and takes care of the bill via your stored payment information. It’s a little different than strict payment apps, though, since you don’t need to pull out your phone to pay the bill. Also buzzing in the reservations space is restaurant ticketing, a service that allows customers to pre-pay for their dining experience (a la theater tickets). The concept isn’t necessarily high-tech, but tech certainly makes it possible, and it was created partly to deal with the problems of digital reservation services. 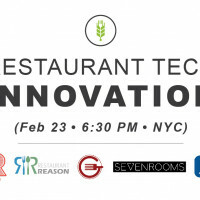 The most publicized version of this is Tock, from Grant Achatz and Nick Kokonas of Alinea and Next in Chicago. They used the system at their restaurants and are now developing it into a product others can license. The concept is similar to buying tickets to a concert: you choose the date and time and you pre-pay for your meal. This reduces no-shows, which can cause massive profit loss for a restaurant and limits the ability to “sell off” a coveted reservation. Expect more competition as services work to sign on partners and continue to improve their apps. I expect the non-virtuous practice of “scalping” reservations to go away, blocked by new products or solutions that come from restaurants. More restaurants will adopt the “ticketing” concept, lead by the restaurants where it works well. Chicago’s Alinea is an obvious example, since Tock was born from its in-house system; San Francisco’s Lazy Bear is another early success. Certainly don’t discount the drive and plans of Grant Achatz and Nick Kokonas of Tock, who have stated, directly, their plans to take on OpenTable, the current leader in the online reservations space. Second to reservations, mobile payment apps are growing in popularity with both restaurants and diners. As consumers become more willing to pay with a mobile app, more merchants are accepting mobile payments. Cover lets diners in New York and San Francisco pay their restaurant bill without asking or waiting for the check. You essentially “check in” to a restaurant and confirm with your server that you’re paying with Cover. Then you can walk out when you’ve finished the meal, no asking for the bill. Cover launched in 2013, but expanded to include San Francisco in 2014 and Los Angeles in March 2015 — almost 200 New York restaurants, 63 Bay Area restaurants and 36 LA restaurants accept Cover. Cover works with any restaurant POS system. Similarly, TabbedOut, which is available in 5,000+ locations in the US, gives patrons the option of paying via app. TabbedOut’s check-splitting feature is the most customizable of the bunch, allowing users to pay a specific dollar amount or percentage of the total when sharing with friends instead of an even split. Pay with OpenTable, which is built right into the OT app, works similarly. Restaurants that already use the OpenTable reservations service are eligible to use Pay with OpenTable, though the company is rolling out the service strategically across the country. In 2014, OpenTable expanded to eight cities nationwide; expect more cities and restaurants to implement the technology this year. OpenTable’s payment system works within the POS system. When a restaurant implements the program, staff can see when diners have paid their bill directly on the screen. LevelUp, another option used primarily by fast-casual restaurants like Sweetgreen and Chop’t, allows customers to download the app and register by storing credit card information. They can then pay in-store by scanning a QR code or using their login credentials. LevelUp handles payment processing and also gives restaurants a way to track marketing campaigns. Then there’s Apple Pay, which comes baked right into every iPhone 6 and 6+. Apple Pay lets you physically pay with your phone using a Near Field Communication antenna, or within apps with the new Touch ID feature on the phone. Even something as simple as downloading an app can be a clunky experience — especially in a dark restaurant at the moment you’d like to use it. Cover tackles this by giving the opportunity to split the check with people who don’t yet have the app (they just have to download it within seven days). Expect even simpler interfaces and streamlined products that make it easier and faster to pay by phone. Payment processors are also great ways to track customer data from spending to order preference, and these companies will continue to offer restaurants insights into customer ordering behavior. Combining payment data with order data gives restaurants the ability to look at larger trends and allows even more efficient decision-making when it comes to things like menu items and pricing. Once upon a time, I didn’t even like to order takeout because I much preferred the restaurant experience. Those days are gone thanks to the growing number of services that deliver the full restaurant experience to your door. Some services make it easier for casual and fine dining to offer delivery, while other services are turning the entire restaurant model on its head. These services allow both restaurants and chefs to expand their reach and branding to an audience outside the dining room walls. Caviar, acquired by Square in 2014 for a reported $90 million in stock, allows restaurants that otherwise wouldn’t deliver to offer delivery services. Dinner-on-demand startups, like Sprig, Munchery and Spoonrocket, deliver chef-created healthy meals to your front door in a matter of minutes. San Francisco-based Din literally brings the restaurant dish to you, partnering with chefs to recreate beloved restaurant dishes and delivering the ingredients (down to single eggs and pats of butter) to your door, allowing you to recreate the dishes at home. There are also startups that literally bring the restaurant to your kitchen, providing the chef, the ingredients to make the meal and the clean up. Both Kitchensurfing and Kitchit match you with a chef who will come to your house and cook dinner for you, a small group, or a big group. 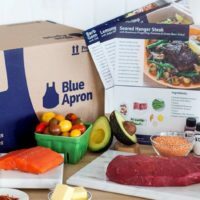 Dinner-on-demand services are still young and poised to grow as consumers become familiar with the technology and products become more refined and easy to use. Momofuku Chef David Chang’s empire is expanding into delivery territory with his involvement in Maple. The delivery service features a menu all its own, developed by a “Culinary Board of Directors.” Mostly, though, the fact that consumers are getting used to enjoying restaurant-quality food in non-restaurant settings enables a whole new type of business centered around delivering either a physical meal or a restaurant experience — and sometimes both. Fast-casual and fast-food restaurants are all over table-side tech, launching dedicated apps and products for ordering and entertainment. Taco Bell’s app launch was one of its biggest advertising and marketing initiatives, and that says a lot given the company’s history of digital savvy communication. Order ahead/pick-up in store apps are commonplace. Pizza delivery will never be the same — the big national chains have apps for ordering, and Dominos added voice support, so you can talk to the app when you place your order (you can also now order via Twitter). 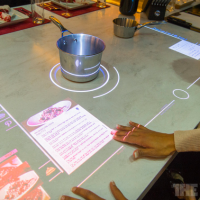 Touch-screens are making their way into more places, with mobile screens on the tables at restaurants like Applebees and Chilis. Table-side mobile ordering isn’t going away. Since customers can order exactly what they want from a restaurant via digital data that connects directly to the restaurant’s system, in black and white, the restaurant can produce the food directly from the customer’s inputted order, reducing error and keeping customers happy. Two-year-olds know their way around iPads, so as the digital generation grows, ordering from a touch screen (in appropriate establishments) will become the norm.